This article is about politics of the island of Ireland. For the politics of the sovereign state of the same name, see Politics of the Republic of Ireland. The sovereign state called Ireland, also known as the Republic of Ireland, which occupies about five-sixths of the island. Its capital is Dublin. 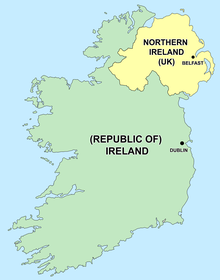 Northern Ireland, a part of the United Kingdom, which lies in the northeast of the island. Its capital is Belfast. Since the enactment of the Anglo-Irish Treaty in 1922, these two jurisdictions have been governed separately. The Good Friday Agreement of 1998 created a framework of shared political institutions between the two parts of Ireland, and also facilitated the restoration of self-government to Northern Ireland, subject to a number of reserved and excepted matters. In addition to these, both the Republic of Ireland and the United Kingdom are member states of the European Union. The purpose of the North/South Ministerial Council is to agree and implement policies common to or shared by both jurisdictions in at least 12 areas where Northern Ireland has competency. At least six of these must to be areas where policy is agreed together but implemented separately through existing agencies in each jurisdiction. At least six further areas of co-operate must be areas were policy is agreed together and implemented through all-island or cross-border agencies. For example, food safety is managed by the all-Ireland Food Safety Promotion Board whereas transport policies may be agreed together but are implemented separately in each jurisdiction. The British–Irish Intergovernmental Conference is a forum through which the two sovereign governments can reach consensus on areas of mutual interest, including the government of Northern Ireland. Lastly, the North/South Inter-Parliamentary Association is a joint parliamentary forum created between the national parliament of the Republic of Ireland (the Oireachtas) and the Northern Ireland Assembly. The Good Friday Agreement also envisages a consultative forum formed from members of civil society, the North/South Consultative Forum. However, this has yet to be established. Devolution of power to Northern Ireland from the UK central government is dependent upon the participation of the Northern Ireland Executive in the North/South Ministerial Council. If devolution in Northern Ireland is suspended, whether owing to the failure of the Northern Ireland Executive to participate in the North/South Ministerial Council or otherwise, the powers of the Northern Ireland Executive revert to the British–Irish Intergovernmental Conference. Three major political parties, Sinn Féin, the Green Party and, most recently, Fianna Fáil, as well as several smaller parties, are organised on an all-island basis. However, only Sinn Féin and the Greens have contested elections and have held legislative seats in both jurisdictions. Additionally, a number of significant civil society organisations, such as the Irish Congress of Trade Unions and churches, are organised on an all-island basis. This page was last edited on 7 May 2018, at 21:13 (UTC).